The Tour de France is the subject of this week's summer special as we look into the science and engineering of professional road bikes, training the human physique to endure thousands of kilometres on the saddle and eating the right food to keep you on the road. 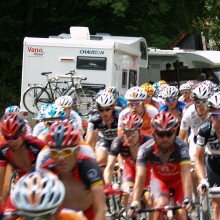 We also go out along some of the stages of the tour, meet a professional sprinter, find out why fans travel thousands of miles to see their cycling heroes in action and meet the doctors, mechanics, and organisers that turn the Tour de France into the well oiled machine that it is! Meera: - The Tour de France is an annual cycle race which takes place in July throughout France and its surrounding countries. And this year's tour saw 22 teams of cyclists battle for a variety of titles and prizes. I joined the Garmin-Transitions team out on the road to see it all in action, as it's not just about winning the overall race, which is what Matt White, their sports director, explained to me when I got there. Matt: - Well, for people who were looking from the outside, I suppose it's the biggest mobile sporting circus in the world. You know, we're travelling pretty much 20 days - 20 hotels, all parts of France, and neighbouring countries, and it's one of the toughest, if not the toughest bike race on the calendar. Meera: - It's the key one really, isn't it? Matt: - It is, because it's global. It has so much global attention. I don't necessarily think it's the hardest climbs or the fastest here or there, but everything that makes the tour "the tour" - that added pressure from the media, from the sponsors, from the riders, from that global audience - that's what makes it so special. Meera: - And how is it actually pieced together? So how does it work? Matt: - Well, there's between 20 and 22 teams depending on how many the organisers pick and basically that's the top 20 teams in the world. It's broken up over 20 stages. The route is different every year. A lot of the stages are similar or use similar climbs or similar finishes, but the route goes clockwise and anti-clockwise. We always finish in Paris and always start in somewhere different. And then in that 3 to 3500 kilometres, there's a big variety of stages -between flat stages for the sprinters, mountain stages for the climbers, and intermediate stages for the guys in-between. Meera: - And is it always a consistent length? Matt: - Give or take a couple of 100 kilometres. Basically, the guys race between 150 and 200 kilometres every day. So, sometimes it's 3,200 kilometres, sometimes 3,500, so roughly the same. Meera: - As well as having the stages, there's also different terrains and different kind of land, so how's that broken up? Matt: - Well, we're always going into the Alps and always going into the Pyrenees. 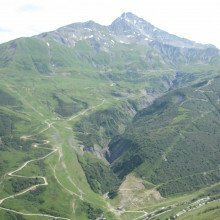 I think that Pyrenees has steeper climbs, harder climbs, and it's usually a little bit hotter down there, and then the Alps are usually better quality roads, and not as steep, but faster climbs. Meera: - There's also cobbles involved, aren't there? Matt: - Not all the time. I think the last time we went over cobbles was 2004, so it's been six years. This year has been a special tour for that. Meera: - And I always imagine that's actually quite a challenge? Matt: - Well it's a race within a race because some of these guys do race on cobbles and the classics in April, but a lot of them are very unfamiliar to that sort of racing and it certainly did put a cat amongst the pigeons that day. Meera: - And how does the actual points or the scoring work? So - there are different jerseys - how are these broken up? Matt: - Obviously the most important jersey, the one that everyone knows, is the yellow jersey and that's the guy with the lowest overall time of that stage of the race. Then there's the green jersey which is the points jersey, or the sprinter's jersey, and that's contested. There's two intermediate sprints per day along the road and then the overall points at the finish line. The sprint stages have got more points than the mountain stages, so it's always a sprinter who wins that green jersey. Then there's the polka dot jersey and that's for the best climber (and the climbs are categorised between small climbs or large climbs - with a higher to lower point system). That's the best overall climber, and then the white jersey is for the best rider under 26 years of age. Meera: - So there are different roles within a team, aren't there? So there are different key cyclists or players? Matt: - And there's different teams within teams - teams have got different focuses for the Tour de France, so they're bringing different riders depending on what their goals are. A team like ours - we've got a bit of a mix, or we did at the start anyway, before our team leader crashed out. We came to try to run top 10 or podium on general classification, and then we've got one of the world's best sprinters - so we had to send a mix between the guys who could support both those roles. Meera: - So what would you say the crucial things are that team Garmin or Garmin-Transitions are going for at this tour? Matt: - Well, it's been a tricky one because of Christian crashing out on day 2, so we've had to change our focus. Christian was obviously our team leader and he's finished 4th and 8th in the Tour de France for the last two years, and for him to crash out, it was a big blow for us. But then we just changed our tact - and obviously Tyler Farrar for the sprint stages. But it was an opportunity for some of these guys to step up and Ryder Hesjedal has done a super job so far and will continue for the rest of the tour. Meera: - As well as the jerseys, there are also time trials that take place and they have a different agenda altogether? Matt: - There is - that's very, very individual. Well some years they have a teams' time trial. This year there wasn't one. Last year there was a teams' time trial - that's every man for himself. In this year's tour there's only the prologue, which is the first stage, and then the penultimate stage in Boudreaux, which is a very long 50-kilometre time trial. Meera: - And I guess just to summarize then, what would you say makes the tour what it is? Matt: - Well, I think tradition. You know - it's in France, it's July, a lot of people are on holiday. And I think in the last 10 or 15 years, the race has become a lot more global - and you see fans and spectators from everywhere around the world. There's not too many sporting events that happen to that degree every single year, so everyone knows where to find the Tour de France - it's on the roads in July. Meera - Now the cyclists on the tour wouldn't be able to perform as well as they do without their support teams of doctors, nutritionists, engineers, and more. 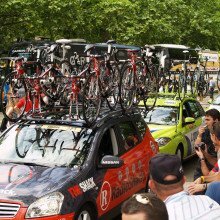 And a factor increasingly playing a key role in winning points in stages is an understanding aerodynamics. With cyclists reaching speeds of up to 100 kilometres an hour on descents down mountains, and wanting to preserve their energy whilst also trying to ride fast on flat stages, the ability to cut through the wind and reduce its resistance is crucial. One man trying to improve this is the team aerodynamicist, Robbie Ketchell. Robbie - Aerodynamics is hugely important for time trials and road races. In time trials wind resistance is the number one resistance on a cyclist. For road races, mainly flat stages, it's the same thing. For climbing - then gravity plays a larger role. So in time trials, they use different equipment that would be more aerodynamic and is just specific for that event, and they also adopt different positions to try to reduce aerodynamic drag, whereas in road races, they draft behind each other ,and ride in packs, and try to help different riders on the team be blocked from the wind. Meera - So as you've just mentioned say, in a road race, when cyclists cycle, they like to stay together in a pack. How much of a difference does this actually make and what effect is it having on their cycling in terms of the energy they use? Robbie - So depending on where they are in the pack and who's around them, they can save anywhere from 25 to 40% of the energy that they would have to produce in order to go that fast alone. And so, it's significantly important for them to conserve energy in say, a 5-hour, 6-hour race in which they don't want to be expending that energy or else it will hurt them towards the finish. Generally, especially for the first week of the Tour de France, you'll see most general classification contenders hiding within the pack and that's just to conserve energy. Meera - I guess this is an important aspect then of team work - how the team all work together in order to protect their key rider. Robbie - Exactly. 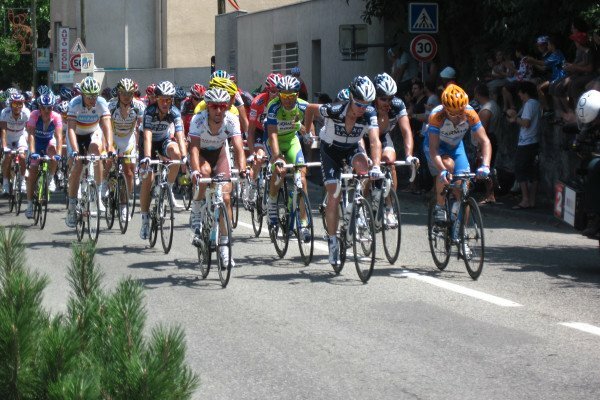 In order to protect your team leader, there are times that you'll see the entire team surrounding that leader, and you'll also see that in sprints, in which you obviously can't sprint from 10 kilometres to the finish. And so - most teams will do what's called a lead out and they will put four or five riders in front of their team sprinter in order to put them on the front, and allow them to ride towards the front of the pack, while conserving energy for them. Meera - So you've said that 25 to 30% of energy can be saved when riding in a pack - why exactly does that happen? Robbie - Basically, what happens when you ride behind somebody is you are blocking that wind - so it basically directs wind around the first rider that hits the wind. The wind goes around that body and it creates a bubble that they can sit in, and that's called "drafting" when they are reducing that wind on the second rider. Meera - And what about as more riders get involved? Robbie - Riding in the middle of a pack, with people surrounding you on the left and right side, and in front, is different than riding in single file and that's why they ride like that. The problem with drafting in single file is that wind doesn't always come from head-on, and so sometimes you'll see people ride in what's called an "Echelon" and they're just off set to the right or left side of the rider in front of them, and that's to draft from the direction that the wind is coming from. Meera - So there's really a lot for a cyclists to be thinking about as they're going along these courses? Robbie - Yes - it's funny you asked that- because drafting, when you're in a bike race, it's almost like a natural occurrence. You can literally just feel that the wind's coming a little from the left and you know to ride a little to the right of the rider in front of you. Meera - Now you've mentioned the importance of drafting, but just how close do the riders actually have to be for this? Robbie - The riders can actually feel an effect anywhere from 2 feet behind the rider in front of them, but you get a larger effect the closer you are to the rider in front of you. So, you try to get as close as possible. Meera - Well that touches on road racing, but another aspect is time trials. What role does aerodynamics play here? Robbie - In individual time trials they obviously can't draft off another rider because they start by themselves. It's actually illegal to draft, so if they were to catch a rider that started in front of them, they wouldn't be able to use their slipstream to draft off of. So what we do in that case is we adapt; we use different helmets, different clothing, different shoes, different bikes, and different positions. Meera - So let's go into positioning first. How does a rider's position affect speed in a time trial and how does aerodynamics play a role? Robbie - The position can contribute up to 90% of the aerodynamic drag - So even though we spend a lot of time on different equipment, position is the number one factor. But in order to reposition somebody to be more aerodynamic, they also have to be physiologically efficient - they have to produce power to actually move the bike. And so, we can't just put somebody in a superman position flat out and expect them to still have the same performance even though it significantly reduces aerodynamic drags. You have to have a balance between the two and that's why you see so many riders with different positions out there. There's not one position that works for all riders. Meera - Well what about the gear? Robbie - There are a number of things that you can do just with the equipment. So for instance, all teams use different time trial bikes. Road bikes generally have round tubings to them because they are trying to make them light and better to go over hills, and also really stiff, whereas time trial bikes have airfoil-shaped tubing to them, to make them more aerodynamic. All riders wear aerodynamic helmets -they have a teardrop shape to them. For clothing in road races - rider wear shorts and a jersey ,whereas in time trials they wear what's called a skin-suit and it's a one piece tight fitting skin-suit. Meera - So these skin-suits and helmets, what are they actually doing to reduce the drag? Robbie - The biggest thing that they're doing is reducing turbulence around the body. For instance, if you were to stand outside in a windy day and you had a rain jacket on, you can hear it flapping. And that similar effect happens when you have a jersey on that's loose fitting, which would be better for climbing, it's a little bit cooler, a little bit maybe lightweight, and not as restrictive. Whereas these skin-suits are tight and reduce those wrinkles, and reduce the turbulence around the body. Meera - You've just touched on climbing there as well. So what role does aerodynamics play if you're a climber? Robby - A much smaller role - generally, when you get anywhere below 20 kilometres per hour, aerodynamics does not play as much of a role. Aerodynamic drag actually increases exponentially to the velocity that you're going. So anytime that you're going at a slower speed, it's not going to contribute as much. Meera - Lastly, how would you summarise then the importance of this to cyclists? How much of a priority is it compared to all the different things they have to consider? Robbie - For events where it makes a difference, it is the most important thing that you can try to manipulate. 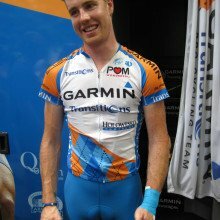 Meera - That was Robby Ketchell, Aerodynamicist for team Garmin-Transitions. Meera:: This is a special edition of the Naked Scientists with me, Meera Senthilingam. As this week, we're exploring the science and technology behind the Tour de France. Endurance events like this one rely on strong, sturdy, yet fast equipment to win points, time and stages. So the structure and design of these road bikes is constantly developing. To find out more about their design, I went along to the warehouse of Trek Bikes, providers to team RadioShack on the tour, and met media officer and avid cyclist, Chris Garrison. 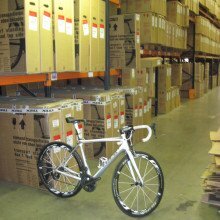 Chris - Bicycles basically have the same shape, no matter what they're made from. You'll have basic things, like the shape of the handle bars will either be flat or they might be Ram's horns, which are road bike bars. What you really need to look at is what the bike is made out of. Is it a metal bike or is it something else - a "composite material" we say. The highest end bikes are going to be made entirely of carbon fibre. Most other bikes, the common bikes that you see on the street, are either made from steel or aluminium. The real difference between one bike and another is what it's made from. Meera - Chris, we're currently in the middle of the Trek warehouse. We're surrounded by thousands of very expensive bikes, but we have one particular model here in front of us which is a typical one of your high end road race bikes. Tell me more about its structure. Chris - This particular bike is our flagship model. It's called the Madone. The thing that's going to separate one Madone versus another is the type of carbon fibre blend that we put into the bike. Carbon fibre is a lot like paper; You have something like lace paper that's really thin, you have normal everyday A4 paper - then you can go all the way up to a carbon fibre that's more like cardboard. It's thicker, it weighs more, it's a little bit structurally more sound. The highest end Madones are going to have the most lightweight carbon fibre within them, and we're going to use the heavier weight carbon in places where we need the bike to be very, very structurally strong and stiff. Meera - But what aspects of it are made of carbon fibre? I know the frames are, but interestingly so are the wheels - so it's all just carbon fibre here. Chris - If you imagine what a typical bicycle looks like, you essentially have two triangles that are attached to each other in the middle. In this case, everything in those two triangles on this bike are made of carbon fibre. Also, the part that holds on the front wheel of the bike (which is referred to as the fork) is made of carbon fibre, and in this version, the wheels themselves, the rims, the actual breaking surfaces are also carbon fibre, and then there is a carbon fibre fairing which helps in the aerodynamic proportion of the wheel - that is also made of carbon fibre. So the whole bike from tip to tail, with the exception of the saddle and the things that you actually grip onto with your hands, is made of carbon fibre. The frame itself is not all one piece of carbon, but rather, it's several pieces of the carbon that have been molded individually, and then are pieced together like a giant jigsaw puzzle, and held in place with a space age level epoxy that we borrowed from NASA. Meera - And how much of a difference does this make in terms of performance of the bike? Chris - Carbon fibre is light and fast. If you have someone who is a top level rider like a Lance Armstrong, then when they actually need to put a lot of power into the bike, the material itself is going to maintain its shape. It's not going to deflect. It's not going to be like an aluminium can that you can bend and then eventually break apart. It's going to maintain its stiffness and the reason why it's able to do that is because of the forces that carbon fibre is able to take. It's extremely, extremely strong under compressive load, which is the same thing as standing up out of the saddle and putting power into the pedals. You don't want the bike to flex in that situation because then it means that the rider is actually wasting energy in order to make the bike go forward. Meera - But now moving away from the material itself and onto other aspects of the bike, how about the gears? Bikes like this, how many gears do they typically have? Chris - Most bikes will come with 8, 9, or 10 gears in the back, and either two or three chain rings in the front. Meera - And typically say, a rider in the Tour de France - so one of their bikes.. how many gears or what gear combinations would that have? Chris - They'll definitely have two chain rings in the front. Usually, it is one large chain ring and one smaller chain ring. The larger one, they'll use for flats and for descent, one enormous one if they're doing a flat time trial for example, and then either 10 or 11 speeds in the back. Again, it depends on what the terrain is of the day. If somebody is racing in the tour, then they're going to mix the gear combinations depending on what stage they're riding. If they're in a flat stage, then they're going to have harder gears in the back because they don't need climbing gears. If it's a day where they're spending the day entirely in the Alps or the Pyrenees, then their mechanics are going to put a different gear set on their wheels that make it easier to climb those big, enormous hills. At the same time, they'll keep the chain rings in the front probably the same as they are ,because there's going to be a descent at some point, where they really want to drop into those hard gears and start building up lots and lots of speed in the descent. Meera - So that's quite handy that they just change it along the tour itself? Chris - They have a service truck with spare bikes, spare wheels, spare saddles, spare handle bars, spare everything. Meera - Now this particular bike though has electronic gears which is a fairly recent technology in terms of bike. So, how does this actually work electronically and how much of a difference does it make? Chris - At the end of the day, you have a derailleur in the back that moves the chain from one gear to another, and you have a derailleur in the front that does the same thing. What is different about it though is that it's now done by wire instead of by a cable, and as a result of that, the shifting of this bike is extremely, extremely smooth, over say, a cable actuated set up. It also means that the front derailleur knows which gear the rear derailleur is in, and it can adjust itself accordingly, so that you'd get away from that really annoying chain rub that you often hear when you're riding a cabled system. The weight is really no different than its non-electrical counterpart. It has a battery that adds about 58 grams to the overall weight of the groupset, but otherwise, it's kind of one of those things that is pretty cool in terms of the bells and whistles additive to the bike. Meera - But one thing I mainly notice when looking at professional road bikes like these ones, is just how thin it is. So the wheels themselves look like they're about an inch wide or so. Chris - They actually run somewhere between 18 to about 27 millimetres wide, entire width. Typically, what the pros will ride on is probably in the 23-millimetre neighbourhood, and all of that is just designed to reduce the amount of drag that they're experiencing as they go over the road. It's not like a mountain bike where you want to have a thicker tread because you're going over surfaces that aren't paved. In this case, these guys are riding on tarmac roads all the time. They don't need a large contact patch. They want to go fast and the larger the contact patch, obviously, the more drag is going to be on the bike, and that means they're going to go slower. Meera - Chris Garrison from Trek Bikes. Geoff - Well, there's a group of three of us mechanics. We all basically do the same job. Most of the work is done in the evening - and then this morning, it's just basically tyre inflation, putting the spare bikes on top of the race cars or the following cars, and putting the race bikes on the other cars to transport them to the start, that's it. Meera - The race is due to start in under an hour, so we're just here by the team cars with all the bikes on top. So how much do one of these things weigh? Geoff - 6.8 kgs complete. Meera - And there's actually a rule isn't there, about how little that weight can be? Geoff - The weight is 6.8 kilos. Meera - So you're right on the dot. Geoff - We always try to make sure that every bike is right on the dot. Everybody has a choice of shape that they can use, and size, what have you. The handle bars -the smaller riders use narrower handle bars, the bigger rider uses a wider handle bar, a longer stem, a shorter stem. The bikes are basically made to measure for each rider. Meera - How many bikes does a rider get through really? So I guess only when something bad or crash happens. Do they swap or do they just swap anyway just for freshness? Geoff - No. I mean, here at the tour, each rider, if you'd include their time trial bike, every rider has four bikes. So they have their race bike, their primary race bike, then they have what we call their first spare bike which goes on the first chase car, and then everybody has a second spare bike. So we have many, many plan Bs and plan Cs. Meera - Well then it's no wonder that there are so many cars with bikes on top following them. Geoff - Before, it wasn't like that. I mean, this is my 13th Tour de France and I remember when I first started, every rider had one spare bike and that was it. But now, just basically, every team is a rolling bike shop. We leave nothing to chance. Everything has to be able to be done here at the tour. Meera - So post race, what do you have to do to get everything back on track for tomorrow? Geoff - Okay, so after the race, we'll arrive at the hotel and we'll have to first wash the bikes, clean them, we'll double check them, make sure everything's okay. We'll check and go over them, we'll replace a few small pieces if necessary. Perhaps a guy needs new handle bar tape, new brake pads, maybe a cable here or there. We'll have about 2 ½ to 3 hours worth of work after the race tonight. As well as mending broken bikes, the cyclists may need broken bones mended, which is when team medic, Shannon Sovndal, is called into action. Meera found out more about his role. Meera - But as well as mending broken bikes, the cyclists may need broken bones mended, which is when team medic, Shannon Sovndal, is called into action. I found out more about his role. Shannon - There's a couple of aspects: One is preparing them for the race and making sure that they're just healthy and in top form. The second is the kind of obvious one the doctors perform after they crash, we take care of whatever injuries they have. Then the third is kind of just health maintenance, you know, if they have saddle sores, road rash, things that are ongoing for the race. Then finally, there's a psychology aspect of it as well - keeping them motivated, making them think that they can keep doing this day after day. Meera - Physically speaking then, what makes a good cyclist? Shannon - Really, it's a physiological problem for cyclists, because they're pure endurance athletes essentially. There's not a tonne of technique in cycling when you compare it to other sports like swimming, or something like that. So, it's really can they go fast and create a large oxygen output for a long period of time. That's really what makes a great cyclist - it's their ability to do a large amount of work over a period of time. Meera - What about the different types of cyclists? So the climbers and the sprinters, what's different about them physically? Shannon - Generally, the climbers are going to be light. Anything that you're carrying extra is heavy to get up a hill. So it's all about, you know, the amount of work done and what distance you get for that work. So a light small cyclist can go uphill faster and they generally have the ability to put out a large amount of power for an extended period of time, whereas a sprinter can put out a huge amount of power for a short period of time. And to do that, they usually need to be bigger, they just need to have more muscle bulk, more muscle fibres, to actually put out that power output. Meera - And what about things like muscle fatigue? They're cycling for hours a day, everyday for three weeks here. So that's got to play a vital role, just the recovery from that. Shannon - Absolutely. What the sprinter is good at is suffering for the day and then he can still call on his body to do that short burst of work, even when his muscle fibres are fatigued, whereas a climber will ride the whole day and then at the end has to climb up another category climb. So he can still do another 40 minutes of extended work. And then for any cyclist in the Tour de France, the ability to recover for the next day is key. If they can't do that, they're going to be out of the race. Meera - What about these cyclists that you hear who have got a broken rib and like a broken arm, and they'll carry on for like 200 kilometres up a mountain still, or still win a sprint race. I mean, surely that can't actually be good for your body? Shannon - The Tour de France is not good for your body ,first of all, for any cyclist. The cyclist's job, is to suffer like that if he has a broken bone. They're just tough guys. They're mentally tough, period, because that's what their sport revolves around. A big component of being a professional cyclist is suffering. They've got to shut off their brain and say, "Whatever pain I'm having, I just work through." Meera - Talking of injuries, what's the worst you've seen? Shannon - Very bad head injuries are the most concerning thing, and, certainly, everybody should be wearing a helmet. You ask any professional cyclist almost, and they'll tell you that they've at some point been saved by their helmet. I mean, literally, saved. You know, your helmet falls off your head after you crash and you're okay. But head injuries, you know, the most severe and then your spine, those kind of things - everything else you know, you actually can get through, kind of. Meera - Team doctor, Shannon Sovndal, explaining the physiology and increased pain thresholds of professional cyclists. with Adrian Elliott, Fergal Grace, School of Sports and Exercise Science, Kingston University. Meera - We've had an insight into the role engineering can play in producing faster, stronger bikes, but what about the strength and speed of the person on the bike, the cyclist? Cyclists on the Tour de France cover between 150 and 200 kilometres every day, for three weeks, with only two rest days in between. This requires an extreme level of stamina and endurance. So to find out how the physiology required to meet this endurance level can be monitored, and improved upon, when I got back, I met sports physiologists, Fergal Grace and Adrian Elliot in their sports science lab at Kingston University, and took Naked Scientists Julia Graham along for some testing. Fergal - Well first of all, for cyclists, we're looking at their aerobic fitness, which is key to being a top quality performance cyclist. Other things we look at are muscle power. You'll have two different types of cyclists - you'll have the climbers and the sprinters. They've got fundamentally different muscle fibre types. So the sprinters can generate a lot of power very quickly whilst climbers have got a sustained, controlled release of power. 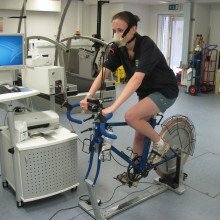 Meera - So, we're currently in your lab here at Kingston at the moment, where Naked Scientist Julia Graham is currently undergoing a VO2 max test. So this is obviously monitoring oxygen, but what does this test involve with regards to oxygen uptake? Fergal - We know how much oxygen is in the atmosphere. If we can measure accurately, expired ventilation - which is when somebody breathes out during exercise, the difference between the atmospheric air and the air that's expired out, is being consumed by the body. The more aerobically fit somebody is, the more oxygen they can utilise per kilo of body mass. That's fundamentally what this test measures. Meera - Julia is currently on a Veletron, which is an indoor bike. She's wired up to all sorts of computers. You're the one here testing her and monitoring her. What are you actually looking at when she's on this? Adrian - At the moment, we can see the amount of oxygen that Julia is consuming per minute. We can see that relative to her body mass, which gives us a good indication and allows us to compare Julia's values to those achieved by individuals of other sizes, whether they are elite athletes or cardiovascular patients. Meera - And what are the measurements at the moment? Adrian - At the moment, we see VO2, which is oxygen consumed at roughly about 30 millilitres per kilogram, of Julia's body mass, per minute. We'd expect that to rise in a healthy, sedentary individual to values perhaps in the 40s. The more trained an individual becomes, and perhaps the more genetically predisposed towards aerobic exercise they are, we should see values in excess of 60, 70, perhaps even 80 millilitres per kilogram per minute. Meera - And how much can someone then train, to actually say, almost double that then? Adrian - Well they can participate in prolonged aerobic exercise. Perhaps some elite endurance athletes would be training for 2, 3, 4 hours a day, trying to look at using the heart and lungs to bring in oxygen, and encourage the muscle cells to actively use that oxygen. Meera - And how useful would you say that this test is then, for pro-cyclists to be aware of their VO2 max? Adrian - It's very useful. It allows them to see their total capacity. So aerobic capacity, the maximum amount of oxygen they can use at sea level, at the moment. What we can also see from the data we're getting in these tests is something called anaerobic thresholds, which will tell us the intensity at which an individual can sustain exercise for extended periods of time, in excess of perhaps 20, 30 minutes. Meera - I guess that is crucial because at the moment Julia will be on this bike for about 10 minutes say. She's not always - if she was to go for hours - going to be at the same peak performance, is she? Adrian - No. Absolutely, not. The values that she achieves at the high intensity stages wouldn't be sustainable for a long period of time. Perhaps what becomes more interesting is the more we can look at Julia, the more we can see what kind of exercise level she can sustain. So she may keep the same total capacity, but if she can train to the point where she can work at a higher intensity, so a higher percentage of that aerobic capacity, then that will come with benefits in terms of performance times, and perhaps placings in an event. Meera - Now Julia, you've been going for 30 minutes on this test. How are you feeling? Meera - How has the resistance been, or how has it generally felt throughout though? Julia - It goes up each time, so by the end it was really tough and I'm pretty knackered. Meera - But initially, so when you first started, were you okay at a steady pace? Julia - Initially, it was really easy and I thought I can do this real easily, and then it gets much harder as you go along. Pretty knackered. Meera - Well Adrian, what are Julia's results now? Adrian - Julia reached a VO2 max, that's the maximum oxygen consumed, of 45 millilitres per kilogram, per minute. So, it's in the range that we would associate with an active, sedentary, but healthy individual. If Julia were to now engage in some aerobic training, perhaps train for a long event, we'd anticipate that her VO4 would rise up into the 50s, perhaps 55 would be a realistic target for Julia at this stage. Meera - So, well done Julia. Julia - Thanks very much. Meera - Now Fergal, what's actually going on inside someone's body then to affect this capacity and this uptake. Fergal - If we look at this, just from the outside, it looks like it's very much breathing, or respiratory based, or based around your lungs. In actual fact, the major changes that are happening are with the heart. The heart is going to become more elastic, going to fill with more blood, and is going to pump that blood around the body. Now what happens with an endurance training program, is that the chambers inside the heart become larger. And in doing so, they're able to hold more blood, and when it contracts, are able to force more blood around the body, so that the body becomes more efficient at pumping oxygenated blood around the body. Meera - What are other tests that you also perform in the lab, to assess other factors, as well as VO2 max? Fergal - Some of the factors we'd look at would be metabolic, and the one that immediately springs to mind, is a lactate threshold test, whereby, another incremental test is done on a number of occasions, and lactate samples are taken at the end of each stage. Lactate is a toxic metabolite in the body, formed from the breakdown of carbohydrates. When it builds up in the muscles, it creates fatigue. Once somebody becomes more efficient at exercise, you can delay the onset of that accumulation of lactate. That's why cyclists would be interested in coming in to have a lactate profile test done, and on the basis of that, they can work out how hard they're going to exercise during their training sessions. They're going to want to exercise on, or about, their lactate threshold. So that is the point at which you're exercising at approximately 70 to 75% of your maximum ability, and the lactate starts to appear in the bloodstream. Meera - A last factor then Adrian, is the fact that a lot of cyclists also, as well as monitoring their oxygen uptake, also look at how much power they're actually producing when they're cycling? Adrian - Yes. Well we've measured power here. Julia reached a value of 170 watts which equates to around about 3 watts per kilogram, for body mass. In cycling, power to weight ratio is the key for most of the performance. In a pro-cyclist, for instance, in the stage in the Col du Tourmalet, leaders were reaching values reported to be just under 6 watts per kilogram, which is an extraordinary amount, even for the most trained individuals. We rarely see values such as that, and they're sustaining those levels over an extended period of time, perhaps 30, 40 minutes for the duration of a climb. 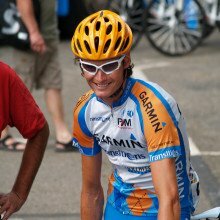 Meera - How would you summarize then, the key factors that are crucial to someone coming in and knowing what they need to make them a good procyclist? Adrian - If we were to prioritise, we'd look at - as we've done today, aerobic capacity, and anaerobic threshold. We'd also be very interested in efficiency of an individual, so perhaps looking at their oxygen consumed per unit of work, or how much of the energy they produce goes into actually moving forward, keeping a low body mass, and a low upper body surface area. Together, those factors are probably the major determinants of cycling performance, particularly at the professional level. Meera - So, although many of us could train to improve our endurance, there are a rare group of humans out there that are actually able to perform at the levels that the pro-cyclists do. So it comes down to genetics in the end. That was Adrian Elliott and Fergal Grace from the School of Sports and Exercise Science at Kingston University. Andrea - [It's a ] Pretty tough one. We don't have an uphill finish. The finish is down on the flat after a four tough category climb. The toughest is the last one. The last one is Col de la Madeleine. It's 23-kilometre longer for about 1800 metres of average gain. Pretty tough climb, considering that before, the riders, they already had to climb three other climbs. Meera - Now we've been driving along most of the route so far and along, and there are various kinds of sprint stages and spots for the King of the Mountain points, and things like that. So, how many of those are there along here? Andrea - Today, there's 2-point intermediate sprints which they bring points for the green jersey and then there's 5 climbing sprints. The last one is the one that carries more points and these are also Hors category climbs., means that it's among one of the hardest climb in the tour. Meera - Well you're an ex-rider yourself. So what kinds of things are going through your mind when you're say, descending at such great speeds, and how fast a speed do the cyclists reach? Andrea - When you go downhill, you just try to envision the best trajectory and try to handle the bike as best as you can, knowing when you have to break, and try to calculate the risk. Of course, Sometimes you don't calculate and there are some crashes. Especially because the surface sometimes is rough and it makes it harder to handle the bike. The maximum speed reached can be up to 100 kilometres per hour, but that's very rare, only when you have a straight section of downhill. Otherwise, 70 up to 90-kilometre per hour. Meera - When it comes to these big climbs like today, there's obviously a change in altitude, changes in temperature, as they're going through the route. So how much did this affect them? Andrea - The altitude doesn't affect too much because okay, today, they're going to feel a little bit the altitude only on the last kilometres over the last climb which reaches a bit over 2,000 metres. The temperature difference is going to affect them more. Today, the maximum temperature change, it varies at up to probably 15, 18 degrees from the very bottom part of the stage when it's going to be probably 33 degrees up to the top of Col de la Madeleine where probably we're going to have 15 degrees maybe. Temperature will affect them more if there's a bad stormy day or rainy day. That's when especially going downhill, the temperature is much lower and your body is already wet from the rain and colder, so that's when you really have to find something to keep the riders warmer. Meera - The race has been happening, the stage has been happening for awhile now, so you've been getting updates here through the radio. So what's been happening so far today? Andrea - So far, the race is at kilometre - around 50, 58, 60 and they have these eight men with 2 ½ minutes lead and then about 3 minutes behind the big perlaton with the yellow jersey. Meera - So they're are about 60 kilometres then so far, what's the actual total length of today's stage? Andrea - It's 205 kilometres. Meera - We've just been driving along the route and they're actually not very far behind us now, are they? Andrea - Well we are going considerably faster [than] them uphill, but then on the descent, then they're are going faster than us. Meera - Now as we've been driving along, there have just been fans lining the entire route and some sections just have hundreds of them and camper vans everywhere. As you're going down the route, how important are these supporters, do you think? How much do they help by being around and cheering? Andrea - They help a lot. I mean, it's so fun. It's good. They really cheer you up especially on the climbs because on the climbs, you just go through two wall of fans and they scream so loud. It gives you definitely an extra kick on your effort when you go up. 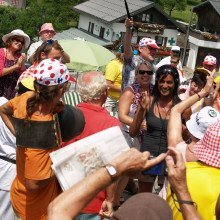 Meera - Now I'm just outside with a lot of supporters that are all lining the streets here following the Tour de France. What are some of your names? Nigel - Nigel from Leamington Spa in England! Hayley - Hayley from Leamington! Meera - Now, why are you all here supporting the tour? What do you think about the tour? Nigel - It's brilliant. What an event! Great! Meera - And are you supporting any particular rider? Nigel - We're going to win it. We're going to win. Bradley is going to win. Meera - Who are you supporting here today? Roy - To drink. We brought a lot of beers of Rose from Savoie and we are here in Notre Dame de Bellecombe. Meera - So you're enjoying it all. Roy - Yes, of course. Meera - How early did you come here then, in order to set up here and look? Meera - Okay. right, so what's yo ur name? Tim - My name is Tim and I'm from South London. Meera - And Tim, why are you here supporting the tour and spectating? Tim - I just think it's a great event, it's a great time, I bought my bike out here and am doing a few of the stages and getting on. Meera - And are you supporting the British riders? Tim - Of course, totally. Meera - Anyone in particular you're following? Tim - Not really. I mean, I just admire them all really. I admire them all for the athletes that they are, so it's great. Meera - It's a great atmosphere out here. Tim - It's absolutely fantastic. Meera - But have I mentioned, the tourists spanned from halfway across the world, as well as local cycling teams, and I met quite a few during my days out there. Meera - Thierry what are you doing here today at stage 10? We're here in Chambery, but you're now part of a big group of cyclists. Is that right? Thierry - I belong to a secretaries team of Chambery. We enjoy to practice bicycle. We climb very often and we know the difficulties to practice into the mountains. And so, we climb at 6 or 7, maybe 10 kilometres per hour, and so, when you know professional practice at about 20 in the same conditions, it's very attractive to know that. Jeff - My name is Jeff Bowden. I live in Miami Beach, Florida and I came here for a week just to watch the Tour de France and just check out the Alps. Meera - And so, that's quite a long way to come specifically to watch it. Meera - And what have you managed to see so far then? So we're on to stage 10 here today. Jeff - Yesterday, we started in Saint Jean de Maurienne. I rode from there to Albertville then Albertville up the Col de Madeleine, went up to the summit to watch all the bikers come up there, and yesterday was a great time. Meera - And what do you thi nk is the best thing about coming to watch it? Is it the atmosphere or is it just the cyclists themselves? Jeff - I think it's the atmosphere, having people just come all over the world in one spot here, all the different languages, and everyone was very friendly to each other, and it was a great time. Dez - My name is Dez Cheatley and I'm from New Zealand. Greg - My name is Greg Brown and I'm from New Zealand. Meera - So that's a long way to come over to watch the tour. So what made you guys come? Dez - First of all, we watch it every year on TV in New Zealand and we look at a lot of the slopes and a lot of these mountains here, and the excitement of the thing and it always looks like it's a flat terrain, but until you actually get your bike and you ride it, that's a whole new ball game. You can see how these guys would suffer and the strength that they have to get up. Meera - Do you cycle yourselves? Greg - Yes, I do. It's the same thing. You look at them and you see the way these guys suffer in the work that they do, and to actually come here and ride the same rides that they ride, and see what they go through, it's a real eye opener. I mean, I take my hat off to those guys. Meera - What about the atmosphere? I mean, we're here at the start of stage 10. There are so many people here. There's publicity vehicles going through. It's quite a festival vibe, isn't it? Dez - It is very festivE. In fact, there's so much passion here for the sport. It's unbelievable. We were just talking about it before. Meera - Have you managed to get quite close to the cyclistS as they pass? Greg - Yeah. I mean, you could reach out. I mean, as close as you are to me, and, in fact if you don't keep your wits about you, they'll ride over you. Meera - And you'd hate to be the person to cause them to do that. Greg - Absolutely. I wouldn't like to take a biker out and down! Meera - So it's clear that a lot of the spectators are avid cyclists themselves. That was a mix of fans from various stages of the tour, explaining their reasons for watching the race. Meera - So far, we've heard how scientists can train their body to handle the endurance required to finish the tour, but what about their diet? As well as being fit, they need energy to keep them going. I went back to Kingston University to ask Dr. Fergal Grace about the calories and nutrients consumed, and needed by these elite athletes. Fergal - After three weeks of cycling, a cyclist who's actually finished the tour is going to have expended approximately 120,000 calories while they were on the bike. We can equate that to about 14/15 pounds of fat. You can take it that they need to consume vast amounts of calories just to finish the tour. 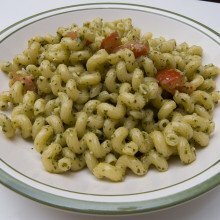 The calories that they'll take on board are going to be a normal athlete's diet - which is a minimum of 60% carbohydrate, 10% protein, and the remainder is fat. And what they will do is up their carbohydrates, maybe lower the fat intake, and as they're cycling, they're going to take simple carbohydrates as gels and high energy drinks, as opposed to hard meals. Meera - What sorts of simple carbohydrates? Fergal - Glucose, fructose, galactose. Taking onboard simple carbohydrates like that takes away the process by which the body has to break down the carbohydrates, so they become immediately useable as a fuel. Now if somebody is exercising for periods of greater than one hour, blood glucose levels - when you exercise at a moderate level of intensity after one hour, start to decline. They're going to have to keep this topped up while they're on the bike. Another thing that they will avoid doing is taking onboard simple carbohydrates immediately before exercise because if you take these simple carbohydrates immediately before exercise and start to exercise, you get an insulin spike and a drop in blood glucose. So they get what's called "rebound hypoglycaemia" which is a rapid drop in blood glucose level, right at the moment that they need to have stable amounts of glucose. Meera - And what about hydration? Especially, I think in this year's tour, temperatures reached ridiculous levels. It was in the high 30s at points, so how important is hydration and how should that be monitored or kept? Fergal - Yes. Well, hydration is absolutely imperative for anybody involved in any type of exercise activity. A drop in approximately 2% of your body weight (so if we're talking for a 50-kilo male - a drop of about 2 kilograms or 2 litres of fluid) can result in a drop in performance of between 10 and 20%. The cyclists in the tour will be hydrated before the race and they will consume approximately 1 litre of water per hour, at a constant rate. Meera - What about energy drinks? Fergal - Energy drinks or replacement drinks are generally high in carbohydrate. So they'll have some complex carbohydrate, but mostly simple sugars. You know, many of them will have some amino acids in them, so you may branched-chain amino acids added in, and they are good. They're a good source of getting the high energy into the body quickly. Mark: - After the race, protein; they're out there on the bike for so long, you're going to get some muscle degradation so to maintain protein balance throughout the 3-week race, those proteins are very important. And of course, fats are important for various other body functions as well, so that's the general order. Meera: - And what about the timings of when they should eat? So now, this is stage 10. The race is in about an hour. What have they eaten this morning and is there meant to be a certain gap? Mark: - Yeah, the guys have a protocol of when they eat in the morning. First, they get up and have some breakfast then an hour or so later to have a race meal with rice and pasta and things like that. Now, just an hour before the race, they also have liquid meals that have carbohydrates, proteins, and fat in certain quantities, so they're well and truly loaded, and ready to go for the race. Meera: - Now moving over to you Matt, the cyclists here are on a non-gluten diet, so gluten-free. Why is that important? Matt: - We implemented that in around 2008, just because we looked at foods which are more difficult to digest, more difficult to assimilate. We noticed that some people had an issue with gluten. Since we've implemented it, we found that guys don't get so bloated when they eat certain foods, so that typically means leaving bread for example out of the diet, but we have also removed many other sorts of simple foods which typically can cause irritation and are harder to digest. Matt: - Such as dairy for example. So, we gave a plan to our chef at the start of the tour, and he knows exactly what our protocols are as related to foods that we want to try and eliminate, and the foods we want to try to replace them with. Meera: - And you also deal with, say, recovery foods. So you know, cyclists, they're greatly using their muscles, they're obviously exhausted after races. So, what's the road to recovery diet wise? Matt: - These days in cycling, you got 16 hours say, from when they get on the bike to when they got on the bike the next day. With that in mind, we sort of looked at the guys' simple blood values and things that some of the riders might have intolerances with or allergies against, so we just try and remove those from the diet. That allows the body to assimilate and digest a lot better without irritation and allow them sort of recover better ultimately. Meera: - Inflammation is the key thing, isn't it? Matt: - The foods that we sort of try and promote if you like are of an anti-inflammatory nature. Cellular inflamation is going to affect everything that a rider does because the body is under stress all day, 4, 5, 6 hours a day on the bike, that is going to create inflarmation. So, anything we can do to sort of stop that in between stages are going to be of benefit for their performance. So the less inflamation you have and the more we can get that under control, the better they're going to perform. Meera: - How would you even go out testing this? How would you know who's more inflamed than others? Matt: - Every quarter, we measure some simple blood parameters such as the arachidonic acids in the blood and the ecopentaenoic acid in the blood, so that's AA and EPA in the blood. And we look at these ratios to tell us how inflamed their bodies are at any given time. From that, we can modify their diet and give them the instructions to modify their diet. So the guys that have been on the team for 2 or 3 years, I mean, they're familiar with these tests, what they mean and how to implement them in order to get the best recovery. Meera: - And just lastly then I guess. If there was one key tip when it comes to diet, what should be remembered by cyclists? Matt: - For me, I would say that the recovery is a massive aspect and so, carbs are king during racing, but it's getting the protein in post stage is really, really important. So, on the bike; carbohydrates, recovery; think protein. Meera: - Nutritionists, Matt Rabin and before that, Mark Quod from team Garmin-Transitions. Tyler: - You know, for me, there's a lot of focus on real maximum power training and high speed work. So we do a lot of sprint training, a lot of riding behind a scooter or a gurney, kind of motor pacing to simulate racing in the final sprints, and then we're doing a lot of work with the power metres to kind of register what kind of values I'm putting out, how that relates to where I was in my preparation before in previous Tour de Frances or Giro d'Italias, things like that. Meera: - What's your goal when you're looking at all of this in the training sessions, and how much impact does that actually have when you're out riding? Tyler: - I mean, at the end of the day, in racing, it's the results that count, not the numbers, but you can at least have a sense of where you're at in your training. I know for example that if I'm doing X number of Watts in a sprint, that means I'll be in about the same shape I was in, when I was doing that right before another race, that I won. So, it's kind of a nice gauge. Meera: - So would you say then that power is more important to you, perhaps say, than monitoring things like heart rate or breathing? Tyler: - It depends on who you are. As a sprinter, you know, sprints are so short, you're heart can't catch up to the workload, so it's power that really measures what you're actually doing. Meera: - How do you handle things like climbs then? Yesterday was a mammoth climb. So how do you handle things like that? Tyler: - I have to train for that just to get through the stages. You know, that's the biggest thing, making it inside the time cut, trying not to kill yourself too much. I actually spend a lot of time training in the hills too, just to kind of build the general condition a lot. Meera: - And I guess when it comes to cycling, it's more than just you as the person. It's your gear, it's your diet, so how much does that all play a role? Tyler: - It's all a factor. You know, bike races are won by really small margins. So, it's all the little things you can change and tweak that make the difference. It's how you're eating, how you're sleeping, how you're training, and if you can do little tweaks that change 1%, that could be the difference between first and fifth place, or something like that. Meera: - Well there's a lot of developments when it comes to say, bike equipment. So is there a particular technological advance that you would say has really helped you? Tyler: - Wheel technology has been incredible. They've really changed the wheels we're racing on in the last 10 years, so you know, bikes don't look the same as they did a decade ago. And there's a lot of limits on what a bike frame can be, how it's shaped, but you know, building faster and faster, lighter and stiffer wheels are what's really made a difference, I think. Meera: - What about what you put inside you - so your diet; is there a key thing that you rely on perhaps, either before a ride, or during, that really helps? Tyler: - As a team, we do an anti-inflammatory diet that is pretty thorough, and then during the race, it's just a matter of staying hydrated, keeping the food in you and you know, when it's as hot as it's been in this tour, staying on top of the hydration is life or death really. I mean, if you don't stay on top of it one day, your tour could be over. Meera: - Well this tour has been particularly hot on certain days, especially I think Saturday, I heard even roads were melting. Tyler: - Yeah. It's been really warm. It's been a pretty cool year up to this date, so not a lot of guys are used to it. We haven't raced in the heat a lot. It's been a bit of a shock to the system, but you expect that on the tour. Meera: - I'm amazed when I hear about someone breaking their arm, or breaking a rib, and continuing to cycle for 200 kilometres. So what's your worst injury been that you've actually then pursued and finished the race with? Haven't you got a broken elbow now? Tyler: - I have a broken wrist right now. I've had worse broken bones, but I haven't continued on with them. You know, I've broken my clavicle a few times and I've broken my wrist before when I haven't been able to race on it. This time, it's a really small fracture and I can kind of just grit my teeth and bare it, but yes, I've been racing since stage 2 now with a broken wrist. Meera: - So, what's your worst injury ever been? Tyler: - I've broken 5 collar bones, 3 wrists, and a rib. Meera: - And you're still cycling. Meera: - Well that would've been awful. Tyler: - You add it all up, yeah. Meera: - I guess actually, a key thing is being part of a team. So how much do you rely on your team to really protect you and keep you going, to help you do your final sprints? Tyler: - It's huge. You know, there's a lot of fighting for position that goes on before the final sprint itself, and that's where the team comes in to lead the sprint out and you know, let me sit back in the draft, and let them put me where I need to be. You know, it's a little harder to put it into practice because there is 20 other teams trying to do the same thing, but you know, we do the best we can. Meera: - So what are your aims for this particular tour? Tyler: - The hope coming here was to win a stage. I've been second on one stage. Breaking my wrist derailed that a little bit because for me personally, the most opportunities were in the first week, and when I broke my wrist, I missed almost all the sprints because for the first three days, I couldn't really sprint. Meera: - How did you break it? Tyler: - There's just a lot of crashes on stage 2 and I was in one of them, and just hit the ground wrong. Meera: - Has there been anything this year that's new, that's kind of revolutionised perhaps, the tour, or cycling, or the route? Tyler: - I think the way that teams have progressed in the last few years has really changed cycling a lot. Teams function as a unit a lot more than they used to. Races used to be won by individuals a lot more, and now, it's truly team efforts to win races, almost always. Because the teams are functioning as a unit, the technology is becoming way more dispersed within the peloton, because before, the top rider might have the best stuff and then the team-mates would just have the leftovers. Meera: - the second goods. Tyler: - Yeah, and now, it's kind of you know, everyone's riding on the same stuff, everyone has really top equipment, raising the general level of the technology of the sport. Meera: - And your thoughts for today? Tyler: - It's going to be a hot one! And it's Bastille Day, so I think the French riders are going to be quite motivated today..
Next Lasers, Atoms and our Universe!